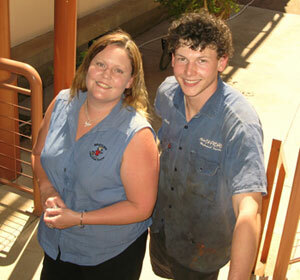 The achievements of two Alice Springs CDU students have been recognised at the 2007 DEET Training Awards. Diploma of Children’s Services student Kelly Adams was awarded Vocational Student of the Year. Certificate III in Automotive (Light Vehicle) student Mitchell Wooding was awarded School-Based Apprentice or Trainee of the Year. Both students are applying their trade at businesses in Alice Springs. Kelly works at the Braitling Neighbourhood Centre and Mitchell Wooding works at Alice Springs Off Road Mechanical Services. Heather Wilson, VET lecturer in children’s services, said Kelly represented the very best qualities of child care managers. ‘She has a rare ability to get the very best out of people and gain their commitment to the child care centre,’ she said. Both students are invited to attend the national finals to be held in Hobart later this year. Dianne Underwood, Campus Administrator for Alice Springs, said the results reflected the commitment of lecturers and students to quality educational outcomes. ‘Kelly and Mitchell have set examples of commitment and professionalism in their trades and are now making great contributions to businesses here in Alice Springs,’ she said.